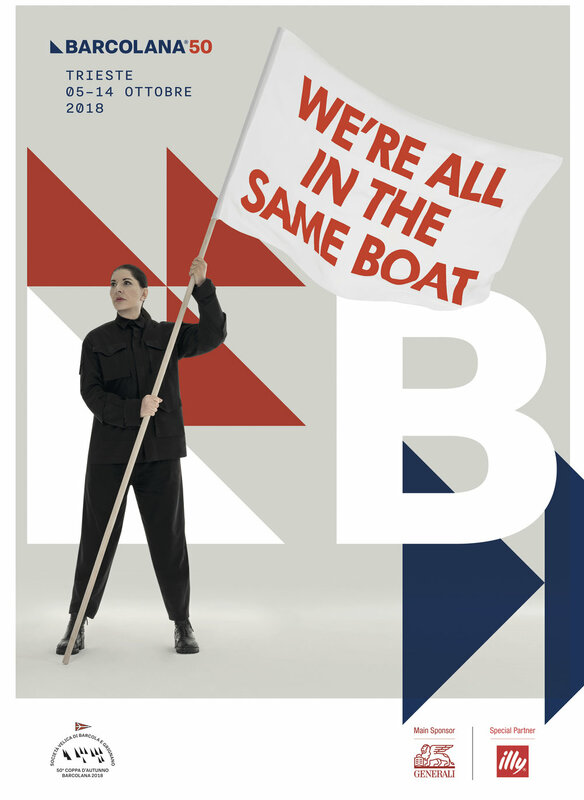 Artist Marina Abramović created a poster for Italy’s 50th Barcolana sailing regatta in Trieste featuring the artist waving a flag that says, “We’re all in the same boat.” Italy’s far-right ruling party has taken issue with the poster, calling it “propaganda,” assuming the commentary is against Italy’s recent decision to close its borders to refugees. Triste’s deputy mayor, Paolo Polidori, wrote the following statement on Facebook: “[It is] unacceptable, in bad taste, immoral to make political propaganda out of an event, the Barcolana, that belongs to the entire city.” However, Barcolana defends the poster, explaining its meaning is to “stress a simple but crucial aspect: even on different boats, when we compete for the best result, we sail on the same planet, which needs to be guarded and protected daily.” Polidori has since demanded a recall of all event merchandise featuring the poster and has threatened to take away the city’s €30,000 of funding from the event, but Barcolana has yet to bow to the city’s demands of censorship. The Chinese government demolished Ai Weiwei’s Beijing studio this month. The structure was just the latest casualty in an ongoing effort by the Chinese government to urbanize some of it’s rural territories. At the time of the unannounced demolition, there were still supplies and works of art in the building. Cameras managed to capture the destruction with the artist using the footage to post a goodbye tribute on his Instagram. The caption read, “Farewell. Today, they started to demolish my studio 'Zuo You' in Beijing with no precaution. Which I have as my main studio since 2006. It is a[n] East German style socialist factory building.” Weiwei has other studio locations, however, Zuo You was the largest. In the heart of Brooklyn stands a unique living room gallery by the name of Medium Tings. Created and curated by the apartment’s resident, Stephanie Baptist, a cultural producer and editor, Medium Tings was born out of love for African Photography. While studying abroad in London, Baptist fell in love with works of photography by artists of color. After returning to New York, Baptist opened Medium Tings as a gallery dedicated to black artists. Upon a visit, you might find Baptist’s first photography acquisition, a work titled, Untitled (1973) by Hamidou Maïga, among other stunning photographs.